I want to continue in my 11 part series. However, I’m going to be come back to Google Reader. Today, I was introduced to FeedAFever.com and I’m interested to see if it will stick.—If anything I want to be able to make a fair comparison. 37Signals has some interesting philosophies in developing. They believe in simplicity.—Determine the core of what you want to do and do it well. And their product is better for it. I’m currently working on a (personal) super secret project and have allowed their influences to direct a lot of my decisions.—I’ve found pros and cons both ways. As a visual person, it helps if I have something in front of me. I’ll sketch it out and plan it out in my head first. I’ve also found myself re-programming certain elements because I’ve changed my mind along the way on how it should look + work.—but I’m chasing a white rabbit. (Sorry!) However, if this does interest you, the company has written an entire book entitled Getting Real based on their workflow. It’s completely free online. $20 for the PDF. I forked over the money. Their blog is also a good read. In the simplest terms, Basecamp is an online project management service. A more detailed answer would tell you that it allows you to organize messages, files, milestones, tasks, people, and time tracking. I’ve used it at work where I’m on a team of 11 (an internal production team) and we’re serving 100 people. Each of the five departments we serve is set up like a client. I’ve also used it to organize my freelance projects.—Giving access to clients and contractors. To point back to their philosophy, it’s simple. They play to their strengths, projecting it from unnecessary bells and whistles. Yeah, there are always features that it would be nice to have (you can say that for anything), but they understand the scope of their work. It strengths communication. At work, I’ve started projects before, gone to the “kick-off meetings”, been given art direction, exchanged Emails, and completed the visual research, only to had the project off to another designer. Since everything is in Basecamp, the handoff really does become a painless process. The other person immediately has access to all the conversations, meeting notes, and files that I’ve already compiled. Easy Peasy. In the freelance world, clients love it because it centralizes all the content. Hundreds of emails may be exchanged over the course of a project. But, if messages are posted within Basecamp I still receive an Email, but the history is on Basecamp. I can comment on certain messages, maintaining threading. Other people within the company have access to the conversations, which can easily be referenced and linked within other messages. In both environments, I’ll post comps on Basecamp. This allows my boss or client to provide feedback all in one place. When I’m planning out milestones for a project, it’s easy to see how one project relates to another. For example, I may have a request for a nametag. That’s a simple request. I’d like to tell my colleague that it could be completed by the end of the week. However, via the Dashboard, in Basecamp, I can tell I have due dates in all my other projects, the rest of the week. That nametag design, as easy as it may be, is not going to happen. Why will I continue to use it? The web world is at an interesting place right now. A lot of companies are trying to figure out how to monetize their services, develop business models, etc. The future of a lot of these companies are in jeopardy. A lot really great services are being shut down because they can’t make the cut. I DON’T think 37Signals is one of those companies. I believe in where they’re going. They have a strong leadership and a good sense of direction. More and more, I’m realizing that these are important factors to consider when determining your company’s workflow and direction, particularly if you’re going to be dependent on a 3rd party service. Outpost (an iPhone App) – my boss actually uses this app. It allows you to manage your Basecamp account on your phone. For him, this is important, since he’s managing a team. For me, though, I really only need access when I’m at work and (already) sitting in front of a computer. There is actually a large list of services on Basecamp’s site of Extras + other services that integrate. Yesterday, I talked about Evernote and how I love being able to catalog items with it. Today, I’m looking at Gmail + Google Calendar. I’ll admit, it scares me when I think about all the information that Google has on me. They could probably profile me better than most of my friends! But at the end of the day, right, wrong, or indifferent, I continue to entrust pieces (ok chunks) of my life to them. I’ve tried a little bit of everything, but at the end of the day it came back to Google. Several reasons. You can’t argue with this one. I really would like to buy into Apple’s Mobile Me. It looks great and integrates nicely with all of Apple’s products. However, I struggle to justify $99 / year when Google offers the same services for free ninety-free! I have all my email accounts forwarding to my Gmail account. Not only can I receive Emails from multiple accounts, but I can also reply using those various accounts as well. Plus, there’s a certain assurance that comes with knowing if my computer crashes, I haven’t lost my Email. I’m part of the GTD cult. When I was using Apple Mail, I tried really hard to keep a folder structure. I even used MailTags. However, emails would pile up in my inbox because I didn’t have/make time to file them properly. The difference with Gmail is that I have labels set up, but most of them are applied automatically through filtering. (i.e. An email newsletter comes in, automatically marked @Read). I’ll still use @Action or @FollowUp, but the majority of items are simply archived as they’re dealt with. I trust Gmail’s search engine to find the email when I need it. Syncing is everything—being able to access my calendar at work, home, and on my phone is make or break. I followed the directions on the Self Conclusion blog for setting up Google + iPhone Syncing. I love that it syncs both ways. I add an event on my iPhone calendar and next time I log onto Google calendar it’s there and vice versa. NOTE: I have yet to sync my contacts because I’ve heard horror stories of Google trying to add every person that’s ever Emailed you to your address book. Google Gears allows you to access your mail offline. NOTE: I’ll be honest in my assessment. Recently, I’ve heard complaints about limited features (i.e. not being able to attach files) while offline. I don’t use this feature a lot (ok, at all) because rarely am I away from an internet connection and even then, I have my phone. Displaying the unread count within the tab favicon. My friend, Lydia, and I sent off for Google stickers. 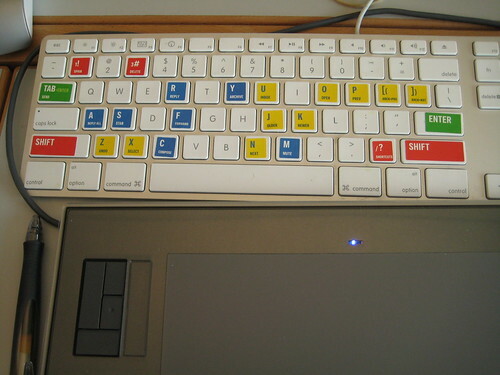 You can’t beat the color it adds to your keyboard (or the number of questions you get) or the handwritten note (“Enjoy the stickers.”) from the GMail Team. I’ve written a more recent (and more detailed) post on how I use Evernote, today. I think one of the hardest things about social media is once you understand what services are available, you must also know how to implement them in a way that works for you–a.k.a. be able to find something when you need it. A lot of times it feels like overlap. I have a friend at work that gives me quite a bit of grief (ok, meaningless teasing) over my numerous accounts. But, this is the system that (currently) works for me. I surf (the web) a lot! –As a graphic designer, I’m definitely a visual person. However, sometimes that makes it hard to categorize information when it’s all in picture form. –Which is why I have found so much success with Evernote. For one, it is able to “read” words within your images. For example, if there was an image that has “Nike” on it, I can search for “Nike” and 9 times out of 10 it will recognize the type within the image. I also tag everything. I’ve found the trick to tagging is to use words that you think you will search with in the future. I’ll also tag things with project names. When the time comes to work on that particular project, all the research I’ve already done is already grouped together. I go into a brainstorming meeting and all my prep work is already done. I used 37Signals Backpack for a while and really enjoyed it. The hard part came when I found items that could technically go on multiple pages. (It was a website, but I really liked the typography. Which page do I put it on? website or typography?) After a while, my pages got REALLY long, making it harder to find information. All their software is free ninety-free! There’s an iPhone app. I can access anything, anywhere. Everything syncs. I have Evernote running on my personal laptop at home and my desktop at work.